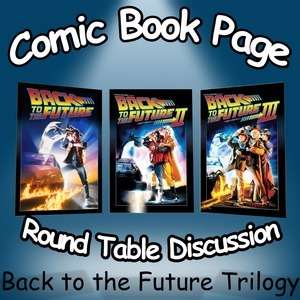 John Mayo, of ComicBookPage, and Kay Kellam, of PopArtsPlace, have a spoilers filled discussion about the classic Back to the Future trilogy: Back to the Future, Back to the Future Part II and Back to the Future Part III. With talk of Pepsi Perfect, Hover Boards, 3D Jaws (Jaws 19), whether or not 2015 is as expected, as well as reflecting on the Alan Silvestri Soundtrack (and musical guest stars) that helped capture the multitude of time periods these three movies brought to screens around the world. This entry was posted in Movie, Podcast, Podcasts, PopArtsPlace, Review and tagged #PepsiPerfect, 1955, 1985, 2015, 3-D, 88, 88 Miles Per Hour, A. Jones, Al White, Alan Silvestri, Antique Store Saleswoman, Ask Mr Foster, Ayatollah Khomeini, Babs, Back to the Future, Back to the Future 3, Back to the Future Part II, Barbwire Salesman, Barbwire Salesman's Companion, Betty, Biff, Biff Tannen, Biff's Pleasure Palace, Bill McKinney, Billy Zane, Bob Gale, Bosom Buddies, Brad McPeters, Buck Flower, Buford 'Mad Dog' Tannen, Buford Tannen's Gang, Bum, Burton Gilliam, Cab Driver, Calvin Klein, Carlson-Wagonlit, Casey Siemaszko, Celebration Man, Charles Fleischer, Charles Gherardi, Chester, Chester the Bartender, Christopher Lloyd, Christopher Wynne, Clara Clayton, Claudia Wells, Clint Eastwood, Clock Tower, Clocktower Lady, Colt Gun Salesman, ComicBookPage, Conductor, Courtney Gains, Crispin Glover, Cristen Kauffman, D. Jones, Dad, Dance Caller, Dannel Evans, Darlene Vogel, Data, Daughter Peabody, Dave McFly, David Harold Brown, Dean Cundey, DeLorean, Deputy, Dixon, Doc Brown, Donald Fullilove, Donovan Scott, Douglas J. Needles, Dr. Emmett Brown, Dub Taylor, E. Casanova, Elijah Wood, Elisabeth Shue, Elsa Raven, Engineer, Evans, Eyepatch, Family Ties, Festival, Flea, flux capacitor, Frances Lee McCain, Frisbie Pie Company, Fujitsu, Gary Riley, George 'Buck' Flower, George DiCenzo, George McFly, Glenn Fox, Goldie Wilson, Granville 'Danny' Young, Great Scott, Griff, Harold, Harry Carey Jr., Harry Waters Jr., High School Band Audition Judge, Hill Valley, Hoverboard, Huey Lewis, Hugh Gillin, Ivy Bethune, J.J. Cohen, James A. Rammel, James Ishida, James Tolkan, Jamie Abbott, Jason Hervey, Jason Marin, Jason Scott Lee, Jay Koch, Jeff O'Haco, Jeffrey Jay Cohen, Jeffrey Weissman, Jennifer, Jennifer Parker, Jim Ishida, Jo B. Cummings, Joe Flaherty, Joey, Joey Newington, John Ickes, John Mayo, John Thornton, Johnny Green, Judy Ovitz, Jules Brown, Junior Fann, Kaleb Henley, Karen Petrasek, Katherine Britton, Kenny Myers, Larry Ingold, Lea Thompson, Leno Fletcher, Leslie A. Prickett, Linda McFly, Lindsey Whitney Barry, Lisa Freeman, Lloyd L. Tolbert, Loretta, Lorraine Baines, Lorraine McFly, Lou, Ma Peabody, Mad Dog, Maggie McFly, Maia Brewton, Marc McClure, Marshal, Marshal James Strickland, Marty Levy, Marty McFly, Marvin Berry, Marvin J. McIntyre, Mary Steenburgen, Match, Matt Clark, Mayor Hubert, McFly, Michael J. Fox, Michael Jackson, Michael John Mills, Michael Klastorin, Michael Mills, Mike Watson, Milton Baines, Mom, Mortician, Movie Theater, Mr. Strickland, Museum Narrator, Needles, Needles' Gang, Neil Ross, Nikki Birdsong, Norman Alden, November, October, October 21, Officer Foley, Pa Peabody, Palace Saloon, Part 2, Part 3, Part III, Pat Buttram, Peabody, Pepsi, Pepsi Perfect, Perfect, Phinnaes D., Photographer, Pie Lady, Read Morgan, Red, Red the Bum, Richard Dysart, Richard L. Duran, Ricky Dean Logan, Robert Krantz, Robert Zemeckis, Rod Kuehne, Ronald Reagan, Round Table Discussion, Sachi Parker, Sally Baines, Saloon Old-Timer, Sam Baines, Sean Gregory Sullivan, Sean Sullivan, Shaun Hunter, Sherman Peabody, Skinhead, Spike, Starlighter, Stella Baines, Stephanie E. Williams, Stephanie Williams, Steve McArthur, Steven Spielberg, Strickland, Strickland's Son, Switched At Birth, Tannen, Terrorist, Terry, Texaco, The Power of Love, Theo Schwartz, Thomas F. Wilson, Ticket Agent, Tim Konrad, Time Travel, Todd Cameron Brown, Tommy Thomas, Toothless, Toyota, Train Fireman, Travel Agency, Travel to the Future, Twin Pines, Universal Studios, USA Today, Verne Brown, Video Game Boy, Video Waiter, Wendie Jo Sperber, Western Union, Western Union Man, Whitey, Will Hare, Wonder Years, ZZ Top on October 21, 2015 by Kay.